Global Founders Capital, the European investment fund set up in 2013 by Rocket Internet founders Oliver and Marc Samwer, has led a $3.5 million Series B funding round in Middle East hotel booking startup Yamsafer. Existing investor Sadara Ventures also participated in the round, along with some undisclosed U.S. based investors. It’s GFC’s first investment in the online travel in this region, although Rocket Internet has previously invested in Namshi, a regional online fashion retailer — and has multiple global travel investments to its name such as Traveloka in Indonesia, or Germany’s Trivago (now owned by Expedia). Yamsafer is located in the West Bank — and claims this is the first “foreign-led venture capital investment of its kind in a Palestine-based company”. It plans to use the funding to accelerate growth and expand its team. 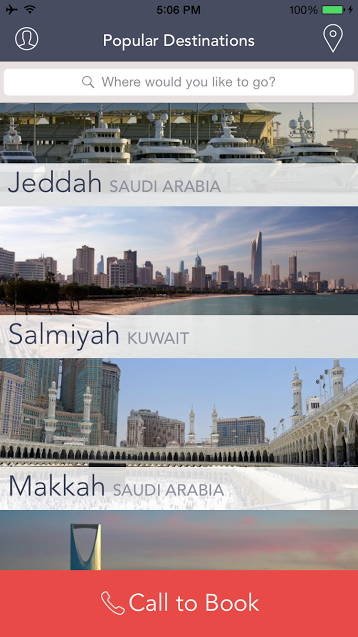 Currently it has some 4,000 properties bookable via its platform. “At the end of the day, capital crosses borders easier than people — at least here in the Middle East. If you’re a good company investors will find you, regardless of where you are,” he adds. Yamsafer’s booking platform focuses on hotels in the Middle East and Turkey — catering to a region where, for cultural reasons, disruptive alternatives to traditional hotels (such as Airbnb) are less strong, according to Zaher. “Airbnb is very weak in the Middle East. I think it’s probably one of its weakest markets, if not the weakest. Mostly because of cultural reasons — that business model does not work very well… Arab culture would not be very welcoming to renting out a room in your house or even renting out your entire house to strangers,” he tells TechCrunch. Yamsafer’s main market is Saudi Arabia, which accounts for around 70 per cent of its transactions. Factor in the other Gulf countries and it’s around 90 per cent of its business. Only around 10 per cent comes from the Levant and European travel coming into the Middle East. “We’ve been growing very fast over 2014 and we’re still seeing that growth. We’re now the second largest online booking service for hotels in terms of transaction volume after Booking.com,” he adds. “We currently cover 18 countries and are focused on inter-regional travel mainly, so people traveling within their own country or from one Arabic country to another. And that’s quite a large market. Zaher says the main competitor for Yamsafer is Booking.com. It has followed the same platform model as its rival but with a tighter regional focus, so it has localized maps and content, and offers things like cardless booking (to cater to travelers who don’t have credit cards) and telephone booking (for those not yet fully comfortable booking online), as well as seeking out more of the types of properties that are popular with its target demographic. “We’re hyper focused on seeing where the demand is going and then supplying that very specific demand of interregional travelers,” he adds.